When you’re looking for someone to teach you the True Inside Secrets of Stage & Street Hypnosis Success and the real world tried, tested and proven to work techniques of Rapid and Instant Hypnotic Inductions then you really should seek out someone who has themselves been there, done that and got the T-Shirt as I myself have done, for at the time of writing this (March 2010) over 20+ Years at venues all over the World. You’d also be well advised to find out exactly who they have taught in the past, do they have numerous Genuine and easily checkable testimonials from people who have learnt Comedy Stage & Street Hypnosis from them and more importantly have these people then gone on to be successful with the skills they have learnt from their teacher? And are they truly capable of teaching you the techniques which would enable you to make anyone do anything even things the so called experts say are not possible such as getting people to reveal their secret and confidential computer passwords like I did on Channels Five’s “The Gadget show” Television Programme? I’ll let you decide for yourself if I am indeed the intelligent choice of trainer to teach you all of the most jealously guarded inside secrets of Stage & Street Hypnotism Success, and remember the techniques of Rapid and Instant Trance Inductions are also invaluable for all Clinical NLP Hypnotherapy Practitioners to learn also! 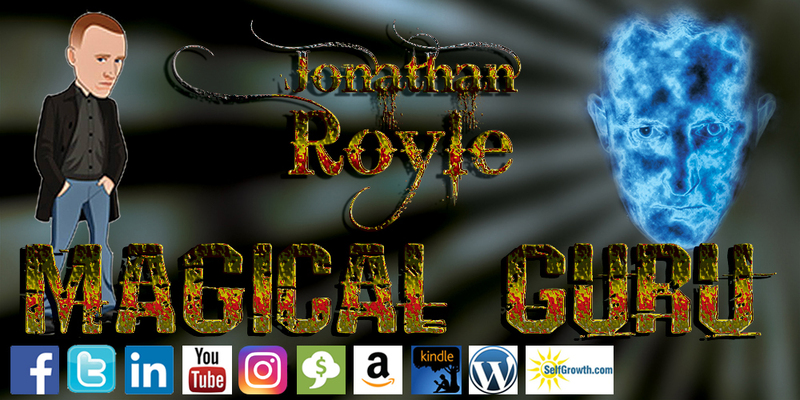 *As those of you who purchase “The Manchurian Approach” DVDs from Alakazam Magic will know I Jonathan Royle am listed on the final credits of the DVDs due to parts of my magical hypnotic coin bending routine being used within the production. You may also be aware that with regards to Anthony Jacquins book “Reality Is Plastic” under my student and colleagues name Stuart Cassels I contributed some routines to the “Proper Mental” PDF supplements which accompany the book! *What you may not be aware of is the fact that I have been combining Magic and Mentalism Routines with Hypnosis Techniques and vice versa since around 1990 (20+ years to date of this posting) and indeed was teaching such methods long before Anthony Jacquin appeared on the scene.. It was great having you there this weekend in Manchester at Speed-Trance. Thanks for your wonderful help and support, for your generous hospitality and for truly helping us to make this all it was! Very best,& Keep On Trancing! *As Already Stated and Illustrated Above I acted as an advisor on UK Hypnosis Laws for Richard Nongard’s & John Cerbones 2009 Manchester England Speed Trance Street Hypnosis Style Rapid & Instant Inductions Training Event. *During 1993 I appeared on Channel Fours Cult Television Show “The Word” taking part in a “Battle Of The Hypnotists” competition against the Legendary Television Street Hypnotist Peter Powers. *After the show Peter Powers was quoted in The Manchester Evening Newspaper as saying “I was Absolutely stunned when Mark Lammars Co-presenter Katie Putrick Said I had Won!” – Obviously even back then in January 1993 when I was aged just 17 years old experienced International Television and Stage Hypnotist Peter Powers felt he had true competition on his hands! *Here’s a clip of Peter Power’s in action, for the record I was consulted by an independent Television Company and wrote for them many comedy hypnosis sketches and advised on UK Law’s for the project which became Peter Powers “Street Hypnosis” show on Bravo..
*I appeared on a British Television Morning Breakfast Show on ITV called “GMTV” along with Paul McKenna to discuss Stage Hypnosis during early 1994 – for the record I also have on file application forms to take my Home Study Stage Hypnosis and Hypnotherapy Training Course from many of the staff and assistant trainers who worked for and with Paul McKenna when his company was called McKenna Breen Training and they all clearly stated that they were taking the course, mainly to learn Stage Hypnosis Techniques and Rapid Inductions and because it had been recommended to them by Paul McKenna! *When Andrew Newton decided that it was his time to start running Hypnosis Training Courses he came to me for help and advice. I taught him how to structure a training seminar correctly and indeed helped to organise the first few seminars and training events that he ever presented, as always I feel that the fact that fellow professionals at the top of their field come to me for advice speaks for itself! *Not only am I the first choice for people like yourself to come to when they want the very best training in Stage & Street Hypnosis Techniques, but also I am sought out on a regular basis by top names in both the Stage Hypnosis and Self-Help Industries to help advise them on putting together high in demand top quality profit producing products which they can sell as part of their business. So Consider this if some of the leading names in the business come to me for help and advice, surely you deserve the best possible training and best possible start in Stage & Street Hypnosis in which case the obvious decision is secure your course dates with me at today before all places are Sold Out! And Remember not only will teach you all of the most powerful inside secrets of Stage & Street Hypnosis but also I’ll teach you my Unique Psychological Treatment Approach of “Complete Mind Therapy” an approach which not only do some of the Worlds Top Stage Hypnotists use my scripting for on their Audio Self-Help CD’s for selling after their shows, but also an approach so powerful that Television Celebrity Life Coaches THE SPEAKMAN”s have also produced (with my permission and under legal license) my Complete Mind Therapy Script for their “Your Key To Becoming The Best Ever You” Audio CD which is already receiving rave reviews here on Amazon. Yes indeed it’s not just the World’s Leading Name’s in Stage & Street Hypnosis that seek me out for help & advice, but also its true to say that I’ve also helped some of the big names in the Self-Help Industry (including amongst many others THE SPEAKMAN’s – www.nikandeva.com) to organise and/or promote their first training seminars and to help create and produce their first products for release to the market place. If I’m the intelligent choice for all these people then surely don’t you deserve the best also? *This show used my exact scripting, wording and actions for Full Body Catalepsy and The Human Blow-Torch amongst other stunts. *Over a period of months before this series was finally filmed for Bravo with my friend and colleague Peter Powers, I through discussions with a television production company (who were one of the companies being considered to make the show for Bravo)devised and wrote many of the comedy sketches and routines which (coincidentally perhaps) were later used and broadcast as part of Peter Powers Hilarious “Street Hypnosis” show which was almost made under the name “Hypnotorious” starring yours truly Jonathan Royle. Formerly owned by Andrew O Connor, both Objective & O’ Connor have purchased numerous of my Hypnosis and Mentalism training DVDS – ideas from which have as a result appeared in several of their most popular Magical & Hypnotic Shows. They amongst other things produce Derren Browns Television Shows! It’s also interesting to note that Derren Brown has recently in his “Enigma” Theatre Show been in the Hypnotic Style second half of his stage show performing Human Full Body Catalepsy which as you will already know from above Objective Productions had already earlier featured in their “Rajan And His Evil Hypnotists” television Series after learning the techniques from my “There’s No Such Thing As Hypnosis” DVD set. And I’m proud to have been sought out to supply my Hypnosis training to many other T.V. Star’s including amongst others one half of Barry & Stuart of C4’s “Magick” And “Dirty Tricks” fame – indeed he rang me up several years ago to thank me and say how much he’d learnt from my Stage Hypnosis Training DVD’s! they will learn a lot more than they bargained for. On the other hand maybe it is best they don’t buy them, then those that do will stand out from the crowd. “I have personally studied many of Royle’s amazing books & courses on Stage Hypnotism, Hypnotherapy, Mind Control, Hypnotic Skills, Hypnosis techniques and related subjects and would say his works are of the highest order. I would recommend them to all that visit this site!